PORT-AU-PRINCE, Haiti, Sept. 30, 2005 - Haiti is struggling to organize its Nov. 20 elections and may have to postpone the balloting for a second time, an elections official said Friday. Patrick Fequiere, one of nine members of the Provisional Electoral Council, said it may be necessary to delay the first round of the elections until late December or January to give authorities time to prepare ballots, distribute voter identification cards and set up polling sites. The vote would be the first since a rebellion forced the ouster of President Jean-Bertrand Aristide in February 2004. "The electoral calendar is too tight," Fequiere said. "I'm convinced we will have to postpone." He said it might also be necessary for the United Nations and Organization of American States, which are already providing assistance, to step in and manage the vote because the electoral council lacks enough trained staff and equipment. "This is not a time for nationalistic pride," Fequiere said. The balloting for president and 129 legislative seats was originally scheduled for Nov. 16, but was postponed to give the country more time to prepare. Haiti's constitution requires the new government to take control on Feb. 7, but it is a complex task because of the country's poor infrastructure, violence that makes it difficult to register voters in some parts of the country and the size of the ballot. Officials with the United Nations and the Organization of American States declined to comment on any possible change in the election date. The United Nations, which has 7,600 peacekeepers patrolling the country, has warned militants not to try to disrupt the vote. PORT-AU-PRINCE, Haiti, Sept. 28, 2005 -- A jailed Catholic priest who was suspended from his religious duties for political activities appealed Wednesday to church authorities to reverse a punishment that supporters claim was intended to halt his growing influence in the Western Hemisphere's poorest nation. In a letter from jail, the Rev. Gerard Jean-Juste challenged the suspension imposed by the Archdiocese of Port-au-Prince after activists in the party of former President Jean-Bertrand Aristide attempted to register the priest as a presidential candidate for the Nov. 20 elections. ``Since I am not a candidate for the election for president I should be able to continue my service as a priest,'' Jean-Juste said in a letter dictated to Bill Quigley, a law professor at Loyola University of New Orleans who is part of his legal team. Haitian authorities ruled that because Jean-Juste is in jail, and could not register, he could not be a candidate in the first elections since Aristide departed the country during a violent rebellion in February 2004. ``He knows that if he decides to run for president and qualifies that he has to be above his priestly duties, but he has not done that,'' Quigley said at a news conference. Jean-Juste was jailed in July on suspicion of involvement in the abduction and slaying of a well-known local journalist, Jacques Roche. Authorities have since expanded the investigation to include alleged weapons violations. The priest, who was in Miami when Roche was kidnapped, has denied the allegations. Jean-Juste, who has drawn comparisons to Aristide for his impassioned sermons and advocacy for the poor, has emerged as a prominent figure in Aristide's Lavalas Family party, which remains a potent political force in Haiti. Amnesty International said in July that Jean-Juste was detained ``solely because he has peacefully exercised his right to freedom of expression'' and should be considered a prisoner of conscience. During a one-day visit to Haiti on Tuesday, U.S. Secretary of State Condoleezza Rice cited the Jean-Juste case, along with that of jailed former Prime Minister Yvon Neptune, as examples in which the government should improve its justice system. ``Justice has to come in a timely fashion, and it should not be the case that anyone can interpret that there is some kind of political motive here,'' Rice said. PORT-AU-PRINCE, HAITI, Sept. 27. 2005 - U.S. Secretary of State Condoleezza Rice, making her first visit to Haiti, told Haitian officials Tuesday that upcoming elections must be "open, inclusive and fair" if they're to help end the country's grinding political crisis. Rice also made it clear in her short visit that the U.S. government doesn't want former President Jean-Bertrand Aristide, ousted in a revolt last year, to return to Haiti. "The Haitian people are moving on," she said. Aristide supporters complain that the U.S.-backed interim government of Prime Minister Gerard Latortue is failing to ensure fair elections and say that two leading members of Aristide's Lavalas Family party have been jailed for political reasons. The party, which has broad support among Haiti's poor, has fielded Marc Bazin as its presidential candidate, one of 32 seeking the office in the Nov. 20 balloting. "I came here because I want to express on behalf of the American people and on behalf of President Bush our backing for the Haitian people at this very important time," Rice said at a news conference with Latortue at her side. "This is a chance for a new day for the people of Haiti." MONTREAL, Sept. 27, 2005 - Queen Elizabeth II's new representative in Canada is a refugee from Haiti â the first black and only the third woman to hold the title of governor general. Michaelle Jean, 48, is also one of the youngest to hold the office, the highest in Canada's constitutional order. It is a sensitive if largely ceremonial post, dedicated to promoting a national identity for a vast country with deep political and linguistic fault lines. "I have come a long way," she said ahead of her swearing-in Tuesday. "My ancestors were slaves, they fought for freedom. I was born in Haiti, the poorest country in our hemisphere. I am a daughter of exiles driven from their home by a dictatorial regime." Her critics claim she is a token and a pawn, picked by Prime Minister Paul Martin to boost slipping support for federalism and his Liberal Party in Quebec. Some say she should have been disqualified from the position because of her alleged ties to Quebec's separatist movement. Martin has stood by her, calling her a talented woman who will bring fresh perspective to Rideau Hall, the governor general's residence in Ottawa. "Born in Haiti, she knows what it is to come to a new country with little more than hope," Martin said when he announced her appointment in August. Jean's family fled the brutal regime of dictator Francois (Papa Doc) Duvalier in Haiti when she was 11. "She is a reflection of that great quality of Canada, a country which focuses on equality of opportunity," he said. "She reflects what we are and what we want to be." Haitian immigrants have been rejoicing in Quebec â the French-speaking province that is now home to 100,000 immigrants or descendants of the Caribbean nation. Other immigrants see Jean, the 27th governor general, as a symbol of what they or their children can hope to achieve in this multicultural nation. Though once a British subject, the governor general â who is also commander in chief of the Canadian Forces â has been Canadian since 1952. Bills passed in Parliament do not become law until the governor general gives them so-called royal assent, but this is done on the advice of the prime minister and his Cabinet and rarely does the governor general dissent. Jean will also hold special powers to promote stability in times of emergency. Outgoing Governor General Adrienne Clarkson was asked to extend her term as the country grappled with the uncertainty of Martin's minority government earlier this year. The divisive issue of Quebec separation could plague Jean throughout her tenure, which is typically five years. A Quebec nationalist publication has asserted she and her French-born husband were once known in Quebec cultural circles as separatists. Though Quebecois narrowly defeated the last independence referendum in 1995, recent polls have indicated that if another vote were held today, Quebecers might favor of some sort of autonomy within Canada. Jean remained quiet about the issue until the furor grew so loud she was forced to issue a short statement confirming her commitment to Canadian federalism and denying that she belonged to any political party or the separatist movement. Jean also announced Sunday that she would give up her dual French citizenship, which she acquired when she married French-born Quebec filmmaker Jean-Daniel Lafond. The road to Rideau Hall has been full of roadblocks and challenges for Jean. The daughter of an abusive father, she also survived cancer. Devastated by her inability to conceive a child, she and her husband adopted one of their own. Jean became one of the first black reporters at Radio-Canada, the CBC's French-language television service, and went on to become a popular anchor and narrator for documentaries. Most Canadians believe Jean will proudly represent their nation, which was built by immigrants and is today one of the most diverse in the world. Still, as she rises to the highest office on Tuesday, demonstrators plan to protest and demand an end to what they see as one of the last vestiges of their British colonial past. PORT-AU-PRINCE, Haiti, Sept. 26, 2005 - Disgruntled presidential hopefuls who were ruled ineligible to run in the Nov. 20 election should appeal to Haiti's Supreme Court, an election official said Monday. Several would-be candidates visited the office of Haiti's Provisional Electoral Council, demanding to know why they weren't on the list published Friday of the 32 people eligible to run. "If the court rules in their favor, they will be back on the list," said Stephan Lacroix, a spokesman for the council. "It is possible, but it also depends on the law." Secretary of State Condoleezza Rice plans to visit Haiti on Tuesday to show support for the elections. During her daylong visit, she will meet with members of the interim government and representatives of a U.N. peacekeeping force. The electoral council has rejected 22 candidates, including wealthy U.S. businessman Dumarsais Simeus, who is the son of Haitian peasants and owner of one of the largest black-owned businesses in the United States. Simeus plans to appeal within the next few days, his campaign said. Lacroix said the candidates must get a court decision in their favor before Oct. 8, which is the official start of the race â the first since President Jean-Bertrand Aristide was ousted following a violent February 2004 rebellion. Simeus was barred because his U.S. citizenship makes him ineligible under the constitution, while other candidates were rejected mostly because they submitted incomplete paperwork, officials said. Jacques Ronald Belot of the Independent Force of Haiti said he was rejected after being told the night before the Sept. 15 registration deadline that he had to put the names of all 70,000 people who signed his candidacy petition on a computer disk. "When I told them it's impossible, the election will be over by the time I finish putting it on the disk, they said that's my problem," Belot said. He is appealing the decision. The 32 approved candidates include two presumed front-runners: former President Rene Preval, a one-time close ally of Aristide, and Marc Bazin, a former prime minister. Other candidates include Leslie Manigat, a former president who was forced from his post by the army in 1988, and Guy Philippe, who led the rebellion that forced Aristide, the country's first freely elected president, out of office and into exile in South Africa. WASHINGTON, Sept. 26, 2005 (AP)  Secretary of State Condoleezza Rice will travel to Haiti on Tuesday to show support for presidential elections set for Nov. 20. During her daylong visit, she will meet with members of the interim government that has been in place since shortly after the departure of former President Jean-Bertrand Aristide in February 2004. Rice also will meet with representatives of a U.N. peacekeeping force that has been attempting to preserve stability in the country as it prepares for the elections. During her recent stay at the United Nations, Rice convened a meeting with representatives of countries that contribute aid to Haiti and troops to the peacekeeping force. Among other topics, they also discussed requirements for holding a successful election. PORT-AU-PRINCE, Haiti, Sept. 24, 2005 (AP)  A wealthy U.S. businessman whose bid to run for president of Haiti was rejected by electoral authorities defiantly pledged Saturday to fight for a spot on the ballot in his native country's first election since the February 2004 ouster of Jean-Bertrand Aristide. Dumarsais Simeus, owner of one of the largest black-owned business in the United States, said he has appealed to the Provisional Electoral Council to reverse its decision to strike his name from the list of presidential candidates in the Nov. 20 election and will do "everything possible," including filing a legal challenge if necessary, to participate in the race. "This election, without us being allowed to participate as a presidential candidate, will have no legitimacy whatsoever," Simeus, the son of illiterate Haitian rice farmers, said at a news conference in the capital. The electoral council late Friday issued a list of 32 approved presidential candidates  a diverse group that includes former government officials from across the political spectrum and a leader of the rebellion that forced President Aristide out of office and into exile in South Africa. Simeus, the 65-year-old owner of a Texas-based food services company, was rejected because he has U.S. citizenship, said Rosemond Pradel, the council's secretary-general. The businessman, who has lived outside his native country for more than 40 years, told reporters that he has always maintained links to Haiti and his citizenship should not be an issue. "I was born in Haiti. I have Haitian nationality. This is not negotiable. Period." Garry Lisade, an attorney for the businessman, said the electoral council misinterpreted Haitian election law, which requires that any objection to a candidacy be lodged within 72 hours of the Sept. 15 filing deadline. Simeus had already received confirmation of the "provisional acceptance" of his candidacy, the campaign said. If the electoral council does not reverse it's decision, Simeus said he would appeal to the Supreme Court. Simeus, who has said he hopes to use his business skills to help the economy of the Western Hemisphere's poorest nation, said he asked the council for an explanation of its decision but has not received a response. In any case, he said he had no intention of abandoning his bid for the presidency. "We are in this battle to stay," he said. "We are in this battle to change the country." The council, which rejected 22 presidential candidates, accepted the candidacies of two presumed front-runners: former President Rene Preval, a one-time close ally of Aristide; and Marc Bazin, a former prime minister who is running as a candidate of a moderate faction of the ousted leader. A former Haitian National Police commander implicated one of his top agents in a drug-conspiracy trial underway in Miami federal court, tarnishing the Aristide government. The U.S. government's star witness said he once taught Haiti's anti-drug chief in high school, served as his boss in the national police, admitted to smuggling cocaine with him and often socialized at his home. Yet on Friday, when asked if he saw him in the courtroom, Jeannot Francois mistakenly identified a federal prosecutor for the defendant, Evintz Brillant. No doubt, the government's key witness got off to a shaky start on the first day of Brillant's cocaine-smuggling conspiracy trial, but Francois made up for it when he directly fingered the defendant's involvement in drug sales and hefty bribes. But the irony of Francois, 43, taking the witness stand against Brillant, 33, was apparent: Francois was never charged for his role in the alleged drug conspiracy, while Brillant faces life in prison if convicted. The charges against Brillant, Haiti's former anti-drug chief, stemmed from last year's wide-ranging probe into the government of deposed Haitian President Jean-Bertrand Aristide. Three other Haitian national police officials have pleaded guilty. Brillant remains the only one to face charges that he shook down Colombian and Haitian drug traffickers for tens of thousands of dollars so they could ship tons of cocaine through the Port-au-Prince airport from February 2001 to July 2003. The trial resumes Tuesday. Before Friday's testimony, U.S. District Judge Marcia Cooke granted the government's request to disallow a polygraph test taken by Brillant in August 2002. He passed the exam -- required by the Drug Enforcement Administration -- indicating he was not involved in illegal drug activity in his country. Brillant's lawyer, Howard Schumacher, urged jurors in opening arguments not to convict his client based on the company he kept in that country. Afterward, Francois testified that he joined Haiti's national police force in 1998. He rose to a command post overseeing criminal investigations, drugs and other units -- before he slipped out of the country amid death threats in 2003. Starting in late 1999, Francois said that he, Brillant and other corrupt Haitian officers took a ''large quantity'' of confiscated cocaine kept in a police vault. Francois said they destroyed half of the cocaine in a ''drug burn'' -- in the presence of DEA agents -- and secretly kept four to six kilos for themselves. Francois said he ''entrusted'' the cocaine to Brillant, who sold it and gave him a $6,000 cut. Over the next three years, Francois testified their illicit network expanded dramatically. At one point, Francois promoted Brillant to anti-drug chief at the Port-au-Prince airport -- the hub for cocaine shipments, shakedowns and bribes. He said Brillant was in the middle of all the deals with Haiti's biggest traffickers, namely Jacques Ketant, Serge Edouard and Ronald Vielot. All three men have since been convicted in the United States. Francois said that Brillant, other police and Aristide's security chief, Oriel Jean, schemed to confiscate $450,000 in drug proceeds from a Haitian-based Colombian drug trafficker at the Port-au-Prince airport in the summer of 2002. Francois said the group gave back $300,000 of the seized drug proceeds to the trafficker, Carlos Ovalle, and kept the rest as payment for their protection. Francois said he was not compensated. OTTAWA, Sept. 25, 2005 (CP) - Michaelle Jean is giving up her dual citizenship in France as she prepares to take over as Governor General - a post that will make her the titular head of the Canadian military. "In light of the responsibilities related to the function of Governor General of Canada and Commander in Chief of the Canadian Forces, I have decided to renounce the French citizenship that I acquired for family reasons in 2004," Jean said in a brief statement issued Sunday. She added that French authorities had formally acceded to her request last Friday. Catherine Gagnaire, a spokeswoman for Jean, said there was no legal barrier, either in Canada or in France, to the governor general-designate continuing to hold citizenship in both countries. But her feeling was that it might appear "kind of strange" to remain a French national while serving as commander of the military in Canada, said Gagnaire. "She just wanted to be sure. She thought it would be better (this way)." Jean, who was born in Haiti but grew up in Montreal and became a Canadian citizen after her family fled political persecution in that Caribbean island nation, is no longer a Haitian national. She took out French citizenship, however, after marrying filmmaker Jean-Daniel Lafond, who was born in France and remains a citizen of that country as well as of Canada. Lafond intends to keep his dual nationality, said Gagnaire, since unlike his wife he will have no official role as either representative of Queen Elizabeth or as head of the military in this country. Aides to Prime Minister Paul Martin have said, ever since Jean's appointment was announced in August, that he considered her dual citizenship a matter of personal choice. Orli Namian, a spokeswoman for Martin, reiterated that view Sunday and said there was no pressure from the government for Jean to change her status. "The decision was always Madame Jean's," said Namian. "The prime minister supports her fully." Jean is to be installed as Governor General in a Parliament Hill ceremony on Tuesday, succeeding Adrienne Clarkson. Her dual citizenship may not have been an issue for Martin, or for other political leaders in Ottawa, but it had raised the concern of the Royal Canadian Legion. Mary Ann Burdett, the president of the Legion, called on Jean last month to "clarify how she can proclaim her true allegiance to the Queen of Canada while pledging loyalty to France as a citizen of that country." Others had noted a 19th century provision in the French civil code that laid out a procedure for stripping citizenship from anybody who took a post in a "foreign army or public service." The French Embassy called that an archaic and "extremely theoretical process" and said there was no question of authorities in Paris using it against Jean if she wished to retain her citizenship in France. The debate broke out in August, at the same time questions were being raised about whether Jean and Lafond had expressed past sympathies for Quebec separatism. Those claims were based mainly on films Lafond had produced, including one in which Jean, a former Radio-Canada television host and news anchor, participated in discussions with well-known separatist intellectuals. Jean sought to quell that storm by issuing a statement saying she and her husband were both "fully committed to Canada," had never belonged to any political party and did not subscribe to separatist ideology. JAMAICA, Sept. 23, 2005 - THE ISLAND is bracing for what could well be another wave of refugees as 19 'boat people' from the neighbouring island of Haiti were rescued by local fishermen off the coast of Rocky Point on Wednesday night and brought ashore. The group includes a man who was only recently repatriated from Jamaica to Haiti in August. The police say that one Haitian is believed to be on the run as 20 identification cards were found in the boat. "They are still being processed and we know for sure that one is a repeat refugee, he has been here before. They will be going through the regular processing between the Ministry of Health and immigration," Donovan Nelson, communications adviser in the Ministry of National Security, said. The Haitians - 15 adult males and four adult females - were rescued by local fishermen off the coast of Rocky Point at 11:30 p.m. and escorted to shore in their 20 foot paddle boat. Constabulary Communication Network liaison officer for the parish, Debbie Douglas-Ellis, told The Gleaner yesterday that upon their arrival, there were signs that they were in good health. "They may have travelled the long journey from their homeland with sufficient food and water, as there was no sign of dehydration," Mrs. Ellis explained. The Gleaner spoke with Elie Breazeau, the man who had been repatriated in August. "I have returned to Jamaica because my mother is persecuting me for the death of my brother," Mr. Breazeau said. "But not only that, as life in Haiti is very difficult, and there is no future for many, including myself." Mr. Breazeau claims that he is the brother of a Haitian who was murdered earlier this year in Montego Bay. His brother was reportedly working as a mechanic at the time of his death. Breazeau said the group left Haiti about 1:00 a.m. on Tuesday, destined for Jamaica in search of a brighter future. In Haiti, hundreds of people have died since Aristide militants and armed gangs loyal to the ousted leader stepped up a campaign to demand his return from exile in South Africa. 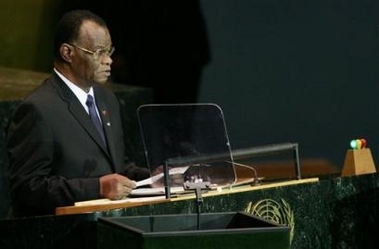 Aristide was ousted in a February 2004 rebellion. Haiti is widely regarded as the poorest nation in the Western hemisphere. PORT-AU-PRINCE, Haiti, Sept. 20, 2005 -- A Haitian judge has ruled there is enough evidence to try a jailed former prime minister in the massacre of more than 40 political opponents during the rebellion that ousted President Jean-Bertrand Aristide, a prosecutor said Tuesday. Investigative Judge Cluny P. Jules decided that former Prime Minister Yvon Neptune and 29 others should stand trial for the February 2004 massacre in the western town of St. Marc, said prosecutor Leslie Jules. The prosecutor said he received the indictments Friday. The Justice Ministry will make the final decision on whether to order the trials, he said. Neptune is one of dozens of Aristide loyalists who have been held without trial for more than a year. The former prime minister has been jailed since July 2004. U.N. officials and U.S. lawmakers have called for Neptune's release, criticizing his prolonged detention without trial. The former prime minister, who has denied involvement in the massacre, staged a hunger strike for several weeks earlier this year to protest his detention. The indictment said that Neptune had been in constant contact with the alleged leaders of the massacre. A list of calls from Neptune's cell phone showed that he had spoken for at least 350 minutes with the alleged perpetrators of the killings from Feb. 7 to Feb 13, when the killings were either being organized or taking place at St. Marc. Neptune's defense attorney, Mario Joseph, declined to comment, saying he had not seen the indictment. Neptune's case became a rallying point for Aristide backers who accused the U.S.-backed interim government of persecuting the ousted president's supporters. Interim Prime Minister Gerard Latortue insists authorities are acting independently to bring former Aristide officials to justice for abuses and corruption. Meanwhile, two men were stoned and hacked to death Tuesday on the outskirts of Bel-Air, a volatile slum of the capital, Port-au-Prince. A wave of killings has claimed at least 20 lives since last August. Residents say the murders are being committed by the so-called "machete army," a group of vigilantes targeting Aristide supporters. Aristide's Lavalas Family Party agreed recently to participate in November and December elections, despite threatening for months to boycott the vote. The Nov. 20 general elections will be the first since the armed revolt that forced Aristide to flee Haiti on Feb. 29, 2004. The indictment said a pro-Aristide gang hacked or shot 44 people to death in St. Marc over three days in February 2004. The massacre came as the government sought to contain the rebellion that ousted Aristide two weeks later. Some witnesses claim more than 100 people were killed in St. Marc. *EDITOR's note: Communicating with his alleged partners in crime for 350 minutes, for example, must not be sufficient ground for Haiti to convict former PM Yvon Neptune. What have the transcripts of the telephone calls made exactly revealed, something of criminal intent? It has yet to be communicated to the Haitian populace. If Haiti court does not want to give the whole world the impression that its magistrates have nothing more than borderline intelligence they must first: 1) demonstrate that he violated an existing criminal statue, 2) prove beyond a reasonable doubt that he did in fact commit the action or actions charged against him, and 3) prove that he had the legal capacity to form a criminal intent. Given our hard-line position, if we may term it so, on notorious former tyrant, Jean-Bertrand Aristide, you may not agree with us, but one thing is for sure wehaitians.com is a serious journal of democracy and human rights. A fact that may attest to so, professors at Harvard University and Boston University, among many others, have proudly cited its editor's, professor Yves A. Isidor, works. Sure it is in indication that he does not permit himself to teach lies or comport himself like a fanatic. In the phrase of Vladimir Lenin, he has vowed not to become a "useful idiot." Voter registration for Haiti's national elections officially ends today, bringing the country one step closer to electing a new president. But the registration process has been plagued by political and logistical problems, and some fear this may compromise the democratic process. Haitian officials and U.N. workers are preparing for the first elections since the fall of former president Jean Bertrand Aristide. The preparations have been marred by massive obstacles, from bad roads and no electricity, to illiteracy and political violence. Registering voters has been difficult, particularly in remote rural areas. While registration started in April, by July many registration centers in the countryside were still not open. Only 2.3 million voters have registered, which is less than half of all eligible voters. The Provisional Electoral Council, known by its French acronym CEP, has led the operations and has had to extend the voter registration deadline at least twice, due to low turnout. CEP spokesman Stephane Lacroix says poor infrastructure has been one of the biggest problems. "For a country like Haiti, there are problems of communications and bad roads. We have seen these images of U.N. officials with solar panels going from village to village because they did not have electricity. It has not been easy," Mr. Lacroix says. "But there is a will, to bring services everywhere. The reproach we have had is an absence in certain communities. But we are doing our best to deploy our resources to reach everyone, by mobile units." But others say the pattern of voter registration may be politically motivated, to skew the outcome of elections. A recent report by the International Crisis Group, says that the interim government has persecuted Mr. Aristide's Lavalas Party and its supporters. The non-governmental conflict resolution organization's report says this could compromise elections. Other critics point out that the seaside slum of Cite Soleil, known for its Lavalas Party support, has no registration center, while upscale neighborhoods that do not support Lavalas have multiple centers. While scores of newly formed political parties registered their candidates, Lavalas may not even participate. For months, Lavalas threatened to boycott the elections. Then in August, the party announced its choice for candidate was Father Gerard Jean Juste. But the CEP barred his registration, saying all candidates must appear to register in person. Father Jean Juste could not show up to register, because he is being held in jail without charges. Police say he is under investigation for the death of Haitian journalist Jacques Roche. Lavalas says the CEP's move is politically motivated. Lavalas is the only party with proven support among Haiti's destitute majority, making it the party most likely to claim the 50-percent majority needed to win. For those who register to vote, choosing a candidate will be its own challenge. Fifty-four presidential contenders stepped forward, including a former president, the leader of a failed coup, and a Haitian born U.S. businessman. The political campaigns are set to start next month. But many Haitians, like computer student Jules Bena, are watching the elections unfold with a mixture of skepticism and apathy. "We are really in doubt about the elections that are about to happen. The election cards are not here yet, the registering process is not complete - we are just going to wait and see," Mr. Bena says. Jules has registered to vote, but he has not received his voter identity card. But he says it does not really matter, because he probably will not vote anyway. The democratic process has never been respected before in Haiti, he says, so why should it start now? SEPT. 19, 2005 - A top Haitian police official in the government of ousted President Jean-Bertrand Aristide is facing trial in Miami on charges that he accepted thousands of dollars in bribes to help Colombian drug lords move huge loads of cocaine through the impoverished Caribbean country. Jury selection is scheduled to begin later this week in the case against Evintz Brillant, the only one of four former senior Haitian police officials who has not pleaded guilty in the investigation of drug trafficking inside the Aristide government. The three who pleaded guilty are expected to cooperate in the U.S. government's against Brillant, who has pleaded innocent and faces a life sentence if convicted. The trial's scheduled Monday start before U.S. District Judge Marcia Cooke was delayed a few days by the approach of Tropical Storm Rita. According to the U.S. Drug Enforcement Administration, Brillant used his post as head of Haiti's top anti-drug police unit from 2001 to 2004 to help drug traffickers ship thousands of pounds of cocaine through Haiti, including the airport in the capital of Port-au-Prince, to the United States, Europe and elsewhere. Brillant and other top Haitian police officials, DEA Agent Noble Harrison said in a court affidavit, ''agreed to look the other way when shipments of cocaine were in transit'' in exchange for bribes, some of which he used to pay lower-level police officers to provide security and protection for the drugs. On occasion, Brillant ''stopped and arrested drug traffickers for the purpose of receiving payments and bribes,'' prosecutors said in court papers. The investigation has produced no evidence implicating Aristide, even though some convicted drug dealers have insisted that the former president was intimately involved in trafficking through Haiti. Aristide was ousted in February 2004 and is now living in exile in South Africa. ''There was never any evidence and there remains no evidence of it [Aristide's involvement],'' said attorney Ira Kurzban, who represents Aristide in Miami. ''They've been trying for two years. There is no case,'' he added. Brillant is specifically accused by U.S. prosecutors of being involved in the drug network controlled by convicted Haitian drug trafficker Sergo Edouard. Brillant was paid $10,000 in one instance for agreeing to protect drug shipments and got a share of $150,000 from another trafficker to provide similar security. Although the Haitian police arrests were trumpeted as a major success in the war on drugs by the Bush administration, a U.S. State Department report issued earlier this year said that the flow of Colombian cocaine and other drugs through Haiti continues virtually unchallenged. The report said that with Haiti's 1,125 miles of virtually wide open coastline, clandestine airstrips, uncontrolled seaports and police corruption it is difficult for the Haitian government to stop the drug trade. 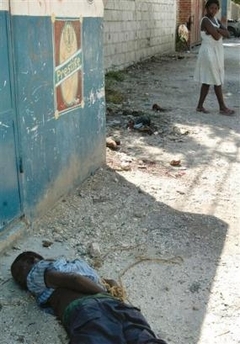 ''Haitian drug trafficking organizations continue to operate with relative impunity,'' said the March report. Freighters are most often used to transport the drugs directly from Haiti to the United States, concealed in shipments of legitimate items such as cement or in hidden compartments. Aircraft are also used, and some drugs are driven over the border with the Dominican Republic to be sent to Puerto Rico and elsewhere, the report says. The other Haitian police officials who have pleaded guilty are Jean Nesly Lucien, the former national police director; Rudy Therassan, a former commander with the police, and Romaine Lestin, former police chief at the Port-au-Prince airport. Therassan was sentenced in July to 15 years in prison, while Lucien and Lestin are scheduled for sentencing in November. UNITED NATIONS, Sept. 19, 2005 - Despite bouts of violence and a climate bordering on chaos, elections in November should return the long-troubled Caribbean nation of Haiti to democracy, the country's interim president said Monday. Still, he said, the poorest country in the Western hemisphere will need international help "to emerge from the miasma of underdevelopment, extreme poverty and squalor ... (imposed under) the bedrock of all dictatorships." President Boniface Alexandre also appealed to nearby nations where Haitians have sought refuge to resolve tensions that have led to attacks. He appeared to be referring to neighboring Dominican Republic, where months of tensions and deportations of thousands of Haitians reached new heights last month when three Haitian immigrants were burned alive. Nov. 6 elections would replace Haiti's first democratically elected leader, Jean-Bertrand Aristide, who was ousted in a February 2004 rebellion. The United States and France sent troops to restore order and installed an interim government now supported by a U.N. peacekeeping force. "The elections will be completely inclusive, all sectors and all political parties will be included in the vote," Alexandre told the assembly. But critics say that hundreds of Aristide supporters and officials have been detained for months and the candidate of Aristide's Lavalas Family party, the Rev. Gerard Jean-Juste, was detained July 21 and officials have refused to register him as a presidential candidate, even though he has not been charged. "I continue to be hopeful that the election campaign will take place in a peaceful climate," Alexandre said. "For months now the country has been living in a climate bordering on chaos. Armed gangs have been holding a number of parts of the capital hostage." Hundreds of people have died since Aristide militants and armed gangs loyal to the ousted leader stepped up a campaign to demand his return from exile in South Africa. 19 SEPT. 2005 - A year after Hurricane Jeanne ravaged Gonaives in Haiti, killing 3 000 and leaving 300 000 homeless, residents still await emergency food aid and fear they have been forgotten. The children, scrawny and half-naked, never stray far from the WFP's premises, where for six months last year more than 750 families were served free meals. "Are they going to start the distribution of rations again?" asked an anxious Mariejean Sylverain, mother of four. She was waiting to feed her children, including a five-year-old who showed clear signs of malnutrition. "Since they stopped this aid, we are living on close to nothing," she said. "We are trying to help ourselves," said another storm survivor as she leaned against a picket fence amid corrugated metal shacks. After Hurricane Jeanne struck, the WFP delivered food to more than 30 000 families, or about 160 000 people, for six months. "We have completed this programme to resume our normal activity to deliver a daily meal to 300 000 school children," said Anne Poulsen, spokesperson for the WFP. At the moment, less than 10% of the eight million inhabitants of Haiti receive aid from the organisation. The latest projects focus on development rather than direct assistance, Poulsen said. "There is nothing for them to eat, there is no hope for them. Government officials have never set foot here. People fear hunger and disease," Edner said. "Their wish is for the resumption of assistance." An octogenarian, Valbrum Valcius, raised a chair in a kind of salute to the WFP representative. Since the last visit, the old man wouldn't have eaten except for the generosity of his neighbours. "I want to say: don't forget Haiti. Don't forget Gonaives." PORT-AU-PRINCE, Haiti, Sept. 18, 2005 - (AP) -- Following a flurry of last-minute registrations, Haiti's Provisional Electoral Council said it would take three weeks to decide who can run in the first election since the ouster of President Jean-Bertrand Aristide. The council must consider the registrations of 54 candidates for president -- a varied group that includes a U.S. businessman, an erstwhile rebel leader, two former presidents, and a former prime minister -- and at least 739 candidates for 129 legislative seats. More candidates for the Senate and Chamber of Deputies are expected to emerge as the council receives registrations from outside the capital, officials said. ''It's a bit crazy, but it shows this country's huge democratic potential,'' council spokesman Stephane Lacroix said. The Nov. 20 election, which has been postponed several times because of the chaos and violence that have paralyzed the country, is the first since Aristide was forced from office following a violent rebellion in February 2004. Voter registration has reached 2.3 million, or about half of those eligible, and authorities decided to extend Thursday's deadline to register until Sept. 20 -- the second extension. Electoral authorities will analyze the registration and expect to release a final list of candidates around Oct. 8, council member Pierre-Richard Duchemin told reporters. A fallen soldier who was born in another country but died for this one in Iraq was buried Saturday. Sgt. Jude Ralph Jonaus, a Haiti native who emigrated with his family to Miami as a teen, spent nine years with the U.S. Army before he was killed Sept. 6. Insurgents set off an explosive that caused his Humvee to topple. Jonaus, one of seven children of Gernessoit and Amenia Jonaus, was 27. Family members recalled Jonaus as a dutiful soldier who served his country well -- a job they said meant more to him than anything else. He joined the army in 1996 after he graduated from North Miami Senior High; he died in Iraq as a pharmacy technician. The Armed Forces were ''Ralpho's'' raison d'tre, said cousin Jessica Philogene. At the one-hour service, Father Reginald Jean-Mary, a prominent community pastor from the Notre Dame d'Haiti, told the more than 50 family members and friends they should remember that life is ephemeral. Joana Philogene said Jonaus would be waiting for his family and friends in heaven. As the service reached an end, several of the mourners burst into cries. Four men struggled to restrain a shaking and shrieking woman as they carried her out. Uniformed servicemen from the Army and Marines stood at attention in the back of the church. Some of them served as pallbearers. Also killed in the attack that felled Jonaus was Sgt. Franklin Vilorio, a Dominican native who graduated from Miami Beach Senior High School. Jonaus and Vilorio -- both assigned to the Brigade Troops Battalion, Division Support Brigade, 3rd Infantry Division out of Fort Stewart, Ga. -- are the eighth and ninth soldiers from Miami-Dade killed in action, according to the Pentagon. Nearly 1,900 members of the U.S. military have been killed since Operation Iraqi Freedom began.